I don’t remember my first haircut but I know where it took place. 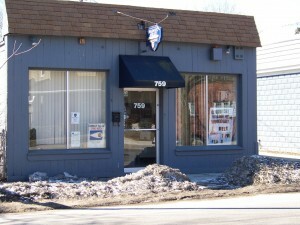 It was at Frank’s Barber Shop on Pocasset Avenue in the Silver Lake section of Providence. We lived on the second floor of a tall three-floor tenement (a triple-decker) on Rye Street. My Aunt Etta and Uncle Vito lived on the first floor and Helen and Harry Mitchell lived upstairs. We all shared the same green grass yard, the same dog (a cocker spaniel named Boe) and the same kids (my brother and I). One day I’d be eating macaroni (we didn’t call it pasta unless it was with beans) in my aunt’s kitchen and the next day Helen would be showing me her new Christmas tree ornaments that had bubbling water inside them. The Rye Street Elementary School that I eventually attended for about one month was right next door on the other side of our fence. Before I was old enough to go to school I used to sit on the 50 gallon garbage can next to the fence and watch all the kids at recess. I even had friends to play with when I was five. Jardo (that’s a girl in case you were wondering) and I ate sandbox sand while under the huge cherry tree in the backyard (there were no front yards in our neighborhood). I remember playing with Eugene (?) who once announced that he had the mumps; curiously I also had the mumps a few days later. My mom did not work and she was obliged to take us everywhere on foot or by bus (my dad drove the only car to work). We would walk a couple miles to Olneyville to shop or four blocks to Frank’s Barber Shop for haircuts. I don’t remember much about Frank’s except that it had one big window in front and possibly a bell that rang when you entered. That all changed when my grandmother died and we moved in with my grandfather (1955). His house was in a village called Conimicut. It was in the suburbs. The house had a little side yard, no front yard, and a backyard that was almost all vegetable garden with one narrow grass path down the middle. We now had a pear tree instead of a cherry tree. The A&P grocery, Rexall drugstore, Rainville’s Meat Market, Kennedy’s Bakery, Rainone’s Cobbler Shop, and Christie’s Restaurant were all on our block. Christie’s was owned by my grandfather’s younger brother who also lived next door to us. Today it is a community satellite police station. We needed to find a new barber shop and the only logical choice was Louie’s. Louie’s was on the south end of Conimicut, a whole three city blocks from our house. It was right across from the Pioneer Market (the Pioneer was owned by the Douquettes – I went to school with Peter and Paul Douquette). Louie’s opened for business on a permanent basis back in 1929. It was actually opened a few years earlier but Louie left and went back to Italy for a while. He came back in 1929 and reopened the shop and it has been in business continually since then. Louie is long gone, the shop having been bought in the early 1950’s by Paul. Paul once told me that one reason he emigrated to the United States from Italy was because he was tired of not having enough to eat. Italians ate well in the United States, not in Italy. He explained that for most people in Italy life was hard and they did not have all the things we enjoy over here. He would visit Italy on occasion but he never wanted to go back there to live. Paul would always ask me how I wanted my hair cut and I would tell him to just use his judgment – he knew best. Paul wasn’t the only barber at Louie’s; we also had Henry. Henry was from Northern Maine and many of his relatives were French Canadian. Henry had a bit of an accent (Maine will do that to you) and always kept up a good conversation, especially when telling me about his young son. I moved out of Conimicut in 1976 when I got married. We lived in Cranston for a year and moved on to Coventry, a half hour drive from Conimicut, where we remained for 32 years. Our most recent move has taken us even farther away to the southern part of the state. Paul is semi-retired now and is only occasionally seen at Louie’s. Mark doing what he does best ! Paul’s son Mark has been cutting hair and talking up a storm right where his dad left off for many years. He has inherited his dad’s talent for both cutting hair and conversation. On busy days John, a barber from Coventry, holds court at the middle chair. We also sometimes see the newest staff member, Al (Marc’s nephew – a real young guy). Henry, still at the window chair, is aging ever so slowly as we all are (he’s been a grandfather for many years now). My son had his first haircut at Louie’s. I took my dad there for his last. These days I get a haircut about every couple of months or whenever my wife complains about my appearance. When I walk into the shop I say “Hi” to the guys and take my place in a seat along the wall while taking note of which customers are before me. I’ve been going to Louie’s for over 40 years and somehow I don’t expect that to change very soon. A final note about the 1929 barber pole: the only way to make it light up is to turn the crank (notice the crank hole on the left side) just like with a Victrola. The last time I was there Henry was kind enough to demonstrate. This experience was truly one of those “you learn something new every day” moments. 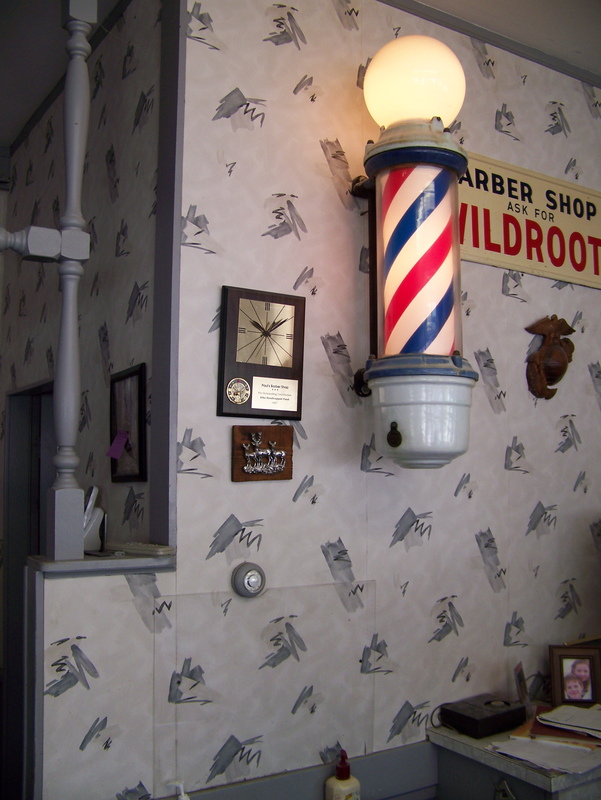 This entry was posted in Occasional Commentary and tagged 1929, barber pole, barber shop, Conimicut, crew cut, crewcut, Gus's, haircut, Louie's, Paul's, RI, Warwick. Bookmark the permalink. 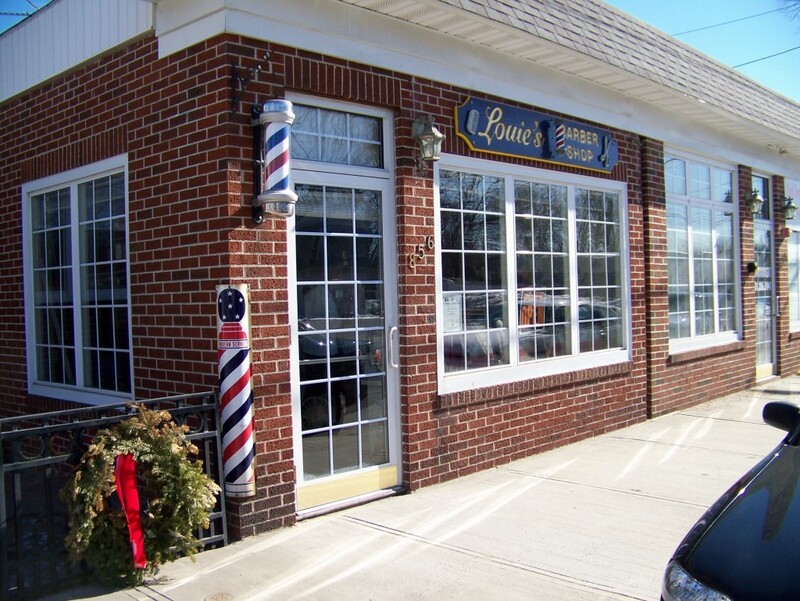 I enjoyed the article about Louie’s, brings back memories when I was a kid and my Dad took me to Sammys barber shop, in Crompton, his shop was located on Cowesett Ave. I think there’s a Walgreens on that spot now. right after the intersection to Crompton. 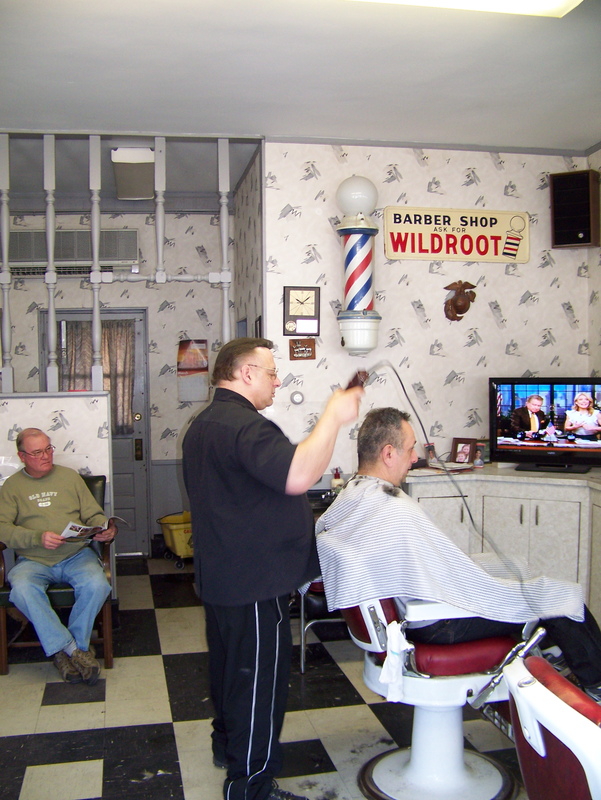 When Sam retired we got hair cuts in his Home , his house was just a couple hundred feet from the parking lot. Dan…. That sounds familiar to me! I’ll bet a lot of people had a similar experience. A barber shop is someplace special … a place where they know who you are. Glad you liked the post. Good day! 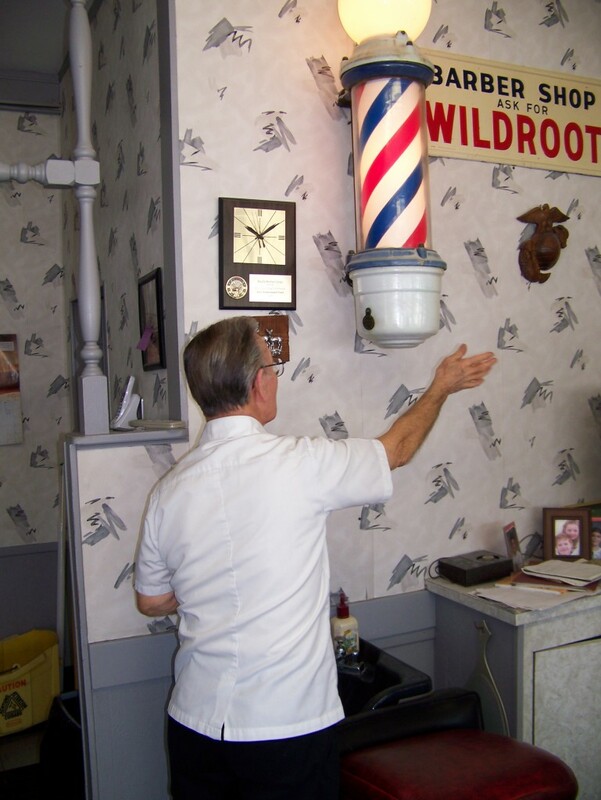 I really enjoyed the article about LOUIE’S barber shop. I am a barber, And for a short season- JAN-MAR 1995, I WORKED AT LOUIE’S, and I worked HARD at louie’s! A very busy and pleasant shop to work in. Very easy going. But we worked hard. Paul and Mark were very nice to me and easy to work for. Henry is a true gentleman. 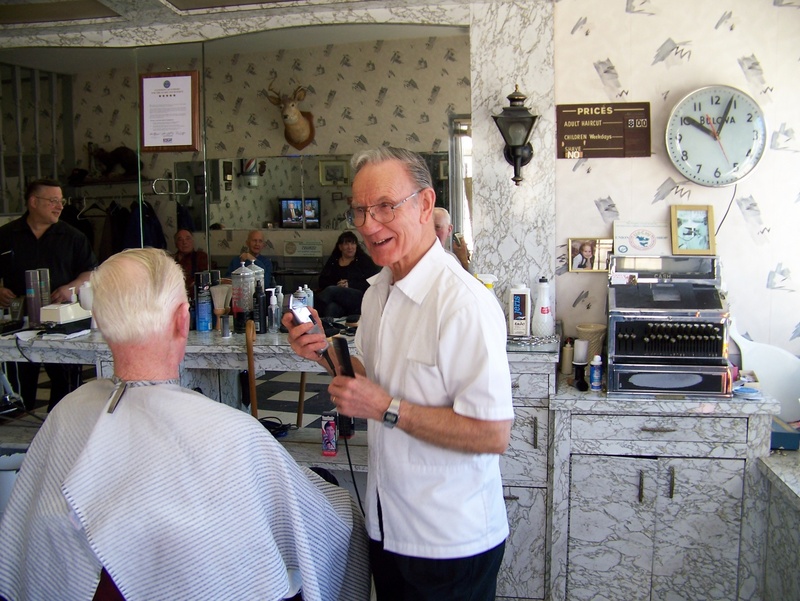 Henry has been cutting hair there for 50 years! I recently asked him, on my last visit, if he has decided if he was going to stay there….LOL It was and still is, a very ITALIAN barber shop and that is what I enjoyed the most while I was working there. NOTHING has changed there as far as the decore. Same beautiful floor, samr beutiful chairs, bright and cheery and CLEAN as a whistle!! I would not know the answer to your question although I am certain that they may have known each other since they were in the same profession and state. You might be interested in a recent Warwick Beacon article that just ran last week. It is about Henry’s upcoming retirement.